More hills today. This time it was down Ladera Norte and up Far West, and then repeat 4 times for a total of 8 climbs and about 10.5 miles. I have to keep this up until I leave on April 13th because the AT has some serious hills. What was special is that when I was about half-way I met two ladies, Jane and Ada, who asked if I was planning I hike. I’m hard to miss now with my full pack and hiker trash clothing – some people might think I’m a homeless hobo. I said that I was going to hike the AT (Appalachian Trail). They asked how much of it, and I replied the whole thing from Georgia to Maine. They said, “Wow!” It’s always fun to meet curious people and tell them about my upcoming grand adventure. And one of them, Ada, was really interested in doing some of the Appalachian Trail herself as a section hiker since she working. I gave her my blog address if she wants to follow me. So, Ada, if you read this you might want to post a comment here – to just to say hi. Also there are others in Austin who are interested in hiking (FB Austin Long Distance Hiking group: https://www.facebook.com/groups/1507664256177219/) and backpacking (Austin Backpackers meet-up: https://www.meetup.com/backpackers-170/). They are good people who you could meet and learn more about hiking and backpacking. Thank you again. You gave me a nice break, and I always enjoy talking about the trail. All the best to you both. As I’ve said before in this blog I hike each day except Mondays and over time I’ve built up my distance and load from a few miles and pounds to about 100 miles per week and 30 pounds. Now it’s time to switch from a weighted vest to my backpack and to reduce my mileage so as to taper before I leave. I’ve been tracking my hikes using the Map My Walk app on my iPhone. Here is a table of monthly mileage I’ve put in since September. 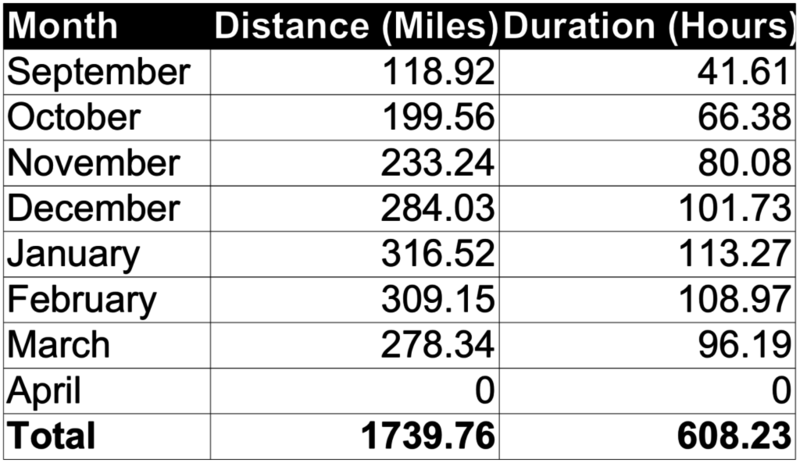 It’s not complete (I’ve got 3 weeks to go), but it shows that I have hiked over 1700 miles in preparation. This is very similar to what I did in preparation for the PCT. So I’m ready – or at least I think and hope I am! I’m getting ready for my hike. Equipment, also known as gear, is a big part of it. I’ve been planning what gear I’ll need (Gear List). Since I’m leaving in less than a month, I’d better get everything prepared and ready. Today I worked on sewing a pillow case. I have a 5L stuff stack that typically contains my down jacket, hat, gloves and a few other soft things. The sack keeps the contents dry if it rains. This sack is essential, because I know it’s going to rain – a lot. However it’s always good to have multiple uses for your equipment. So at night I use this sack as my pillow. To make it more comfortable I created a custom pillow case. 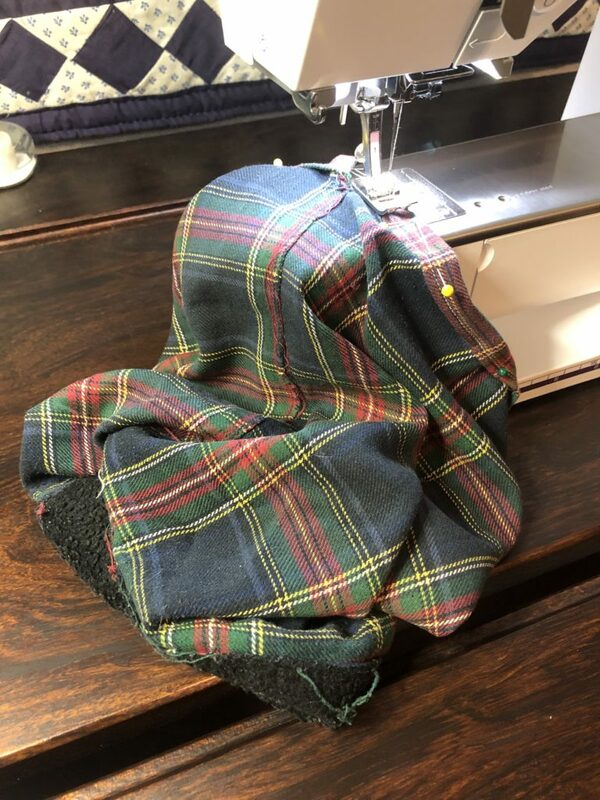 The case has a black circular bottom, plaid material sides (my favorite pattern, because my trail name is “Tartan”) and a drawstring around the top. Previously I had made it too long so today I shortened it. I needed to recut the top, turn it inside out and restitch the drawstring channel on the sewing machine. Next I had to rethread the drawstring, reattach a cord lock and re-tie a knot in the drawstring to keep on the cord lock, and turn it right side out. Afterwards I put it back over my stuff sack. It just fits and the drawstring holds it in tight. 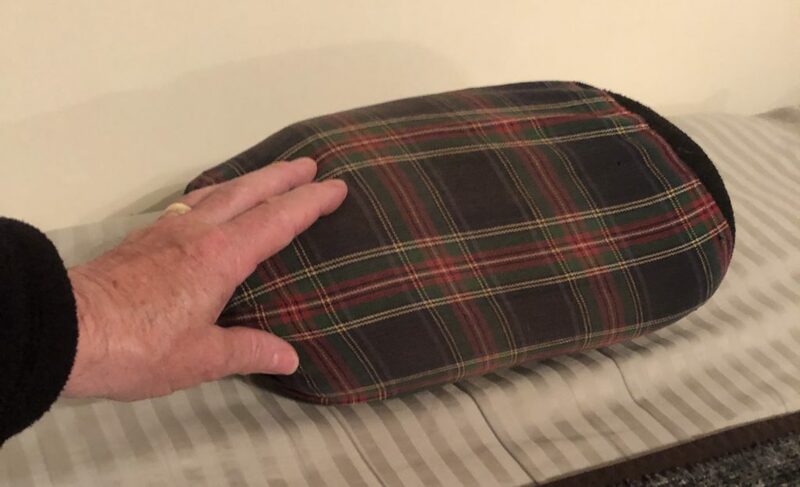 It’s not a big pillow. Just enough to keep my head off the ground. I enjoy doing work like this. It makes my gear special and unique. Sweet!